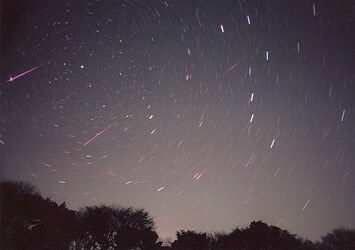 at the Muroh Observatory, Nara, on 18 November 2001 at 19:26 ~ 19:34 GMT. Spica, Vir is seen near the bottom. he brisk Leonid outbreaks on 18 November 2001 were very expected and occurred as expected. The predictions were made by David ASHER (born 1966 at Edinburgh, graduated Cambridge (mathematics) and PhD Oxford (astrophysics)). 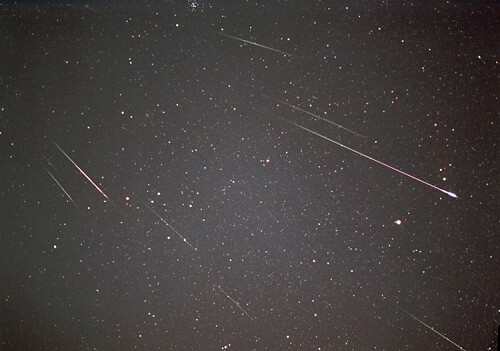 It was already known that the preceding cases of predictions given by David ASHER on the 1999 and 2000 Leonids proved very right: The predicted time of peak to be 02:10 GMT on 18 November 1999 was not far from the visited peak at 02:04 GMT on the day. The predicted peaks at 07:53 GMT on 17 November 2000, 03:44 GMT and 07:51 GMT on 18 November 2000 were attained real respectively at 08:10 GMT on 17 November 2001, 03:45 GMT and 07: 15 GMT on 18 November 2000. Each coincidence was marvellous. from 18:13 GMT on 18 November 2001. 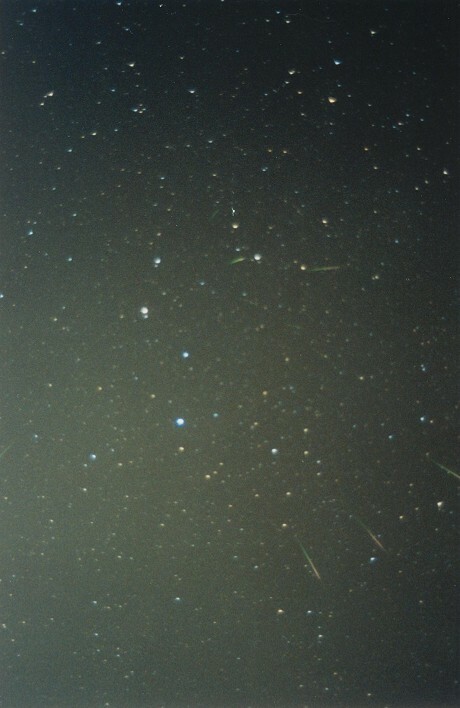 The Leonids are associated with the dusts left by the periodic Comet Tempel-Tuttle (T-T). The McNAUGHT-ASHER theory depends on a possible resonance of the planet Jupiter and Comet T-T. Any comet receives a perturbation from the big planet Jupiter, while in the case of Comet T-T there is a particular commensurability between the comet and the planet, since the comet revolves five times during the period Jupiter does 14 times around the Sun. So the dusts released from T-T can hardly be dispersed, and tend to remain in a high density on the orbit. 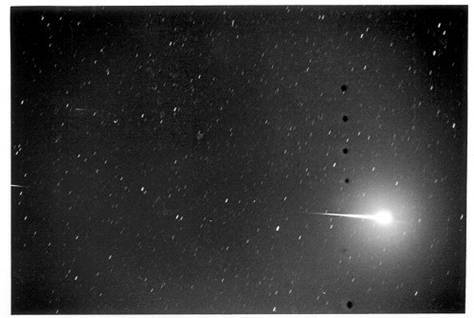 The orbit however receives such a steady perturbation from Jupiter that the dust trails move out from the comet original orbit and so there have been generated several deviated orbits of dust trails. If the Earth hits one of this trails, not necessarily the original comet orbit, an outbreak of meteors will occur. Case 1) is to be caused by the dust trail made in 1767, and 2) and 3) are due to the trails generated from the dust released from 1699 and 1866 respectively. The first one was suited to the American continents, and the 2) and 3) were thus expected to bring the big shows in Asia and Oceania. Note the time when the Earth crossed the orbit of T-T (on 17 November 2001) had nothing to do with the predictions. Hence no other than those who were dubious about ASHER's predictions spent a stupid time outside without no showers on 17 November. 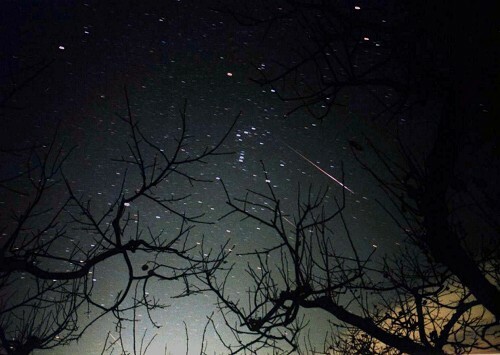 Randy TATUM at Richmond, Virginia USA saw the peak near at 10:00 GMT and wrote "The Leonid meteor shower was well observed here. The humidity was high that night and fog was a problem near Richmond. I observed with a few friends about 50 km west of the city. My friends have 60 acres and a light plane runway on their property. Meteors increased as the night went on and only a few fireballs were seen. One cast a shadow. 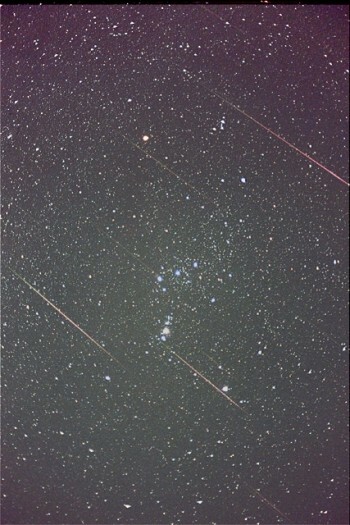 We observed several hundred meteors and they continued to be seen through twilight and the fog! 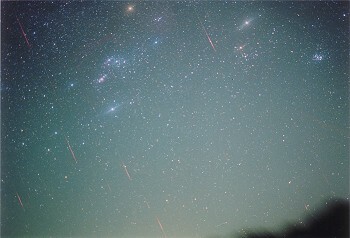 On a radiant photo I count seven meteors. " 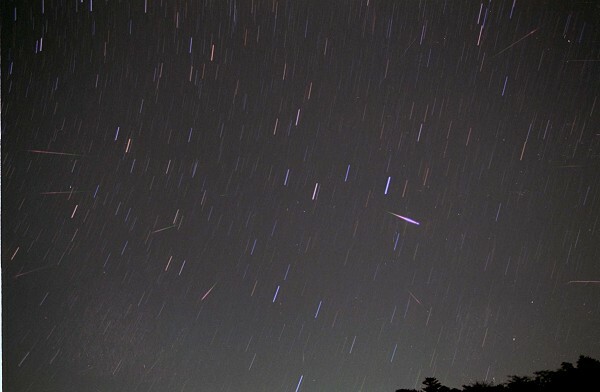 spent the night 18 November watching the Leonids with two friends of mine (Kazuo MORI and Junnichi IIZUMI, ISSEI-KAI) at Kannami located near the Izu Peninsula. As predicted by Dr D ASHER, there occurred happily a great outbreak of meteor shower really on the early morning of 19 November JST. The friends from the ISSEI-Kai were the same persons with whom I watched the Leonid shower in 1965 (in 1966, there happened nothing in Japan while there was a great storm in North America). The shower this year proved much greater than the previous case we experienced. On the night of 18/19 November 2001, we began to watch from 1:00 JST (16:00 GMT), but the sky was rather cloudy. 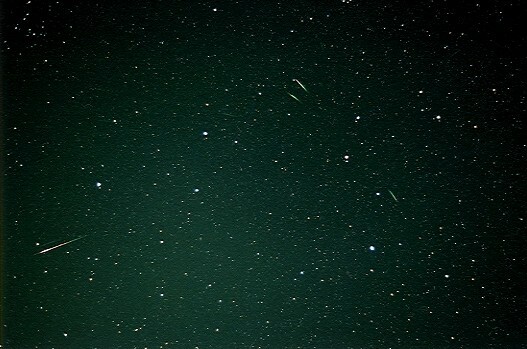 At around 2:00 JST however, the clouds turned to disappear and we could see several bright meteors coming up from Leo, so that we three started to count the numbers of meteors every 5 minutes. We were thus able to watch and count the Leonid shower for two hours and a half up until 4:30 JST when the clouds became again to spread out. Thus we successfully spent the night on watching the dark sky with Orion, Canis Major, Taurus, Gemini, Leo, Ursa Major, Cassiopeia and so on showered across by brisk outbreaks of meteors. 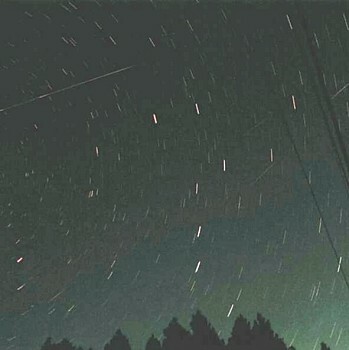 We could capture many brighter meteors in addition to usual ones, and also saw several fireballs some of which left bright remnants durable for longer than 10 seconds. Those that started near Leo were of short tracks and some looked like standing meteors. We also watched several meteors briskly radiated from Leo at the same moment. We here do not yet make any correction to ZHR or CHR, but it is apparent these show a big peak at 18:15 - 18:30 GMT. According to our original data made every five minutes, there was a period where the number of meteors quite decreased or was silent at 17:45 - 17:50 GMT, and hence the doubled peaks were there, but the second one was so big that its foot was wide enough to cover the previous one. We note we could see down to the lower skylines, but we admit there stayed a cloud belt, though not annoying. Rather annoying things were the head lights of the cars that came up one after another to see the showers. I took a train from Kannami, the Tokaido line, to go home at 5:06 JST. Waiting the train on the platform of the station I could saw still some bright shooting stars among the clouds. It was really one of the biggest events ever I experienced. ur long wishes were realised at last on the morning of 19 November 2001 JST ! We hitherto watched many times the sky before dawn every year when the orbit of the periodic Comet Tempel-Tuttle was crossed by the Earth, but we were forced repeatedly to be disappointed. But this time a tremendous peak came just after 3 o'clock exactly in the way as was predicted by David ASHER. The total number of meteors looked slightly less than expected, but here in Nagasaki we could conclude that the HR amounted to about 2000 (so that ZHR = 5000). This big show is believed to be the first ever since 1867 in Japan. 1. We were very anxious about the weather as the predicted day approached. At first the weather forecast did not give any good hint, but as the day came the weather turned out to be better. The sky looked however still cloudy at the northern Nagasaki including the area of Sasebo where we live, and so we (Tatsuo KANAMARU and I) drove from Sasebo southward about 80km to Unzen at the Shimabara Peninsula. We chose Takaragahara at Unzen as a candidate and arrived at the observing site (which was located at (130.26°E, 32.73°N), and height 720 metres above the sea; according to the GSP) at 22 o'clock JST, and found the sky was preferable, and starry. Mr KANAMARU phoned up his home at Sasebo and was informed that it was rainy at Sasebo at the moment. Oh, it looked we had done lucky. Ca c'est bon! c) Taking pictures by the use of a high-sensitive Video camera. The last one is a link in the Astro-HS 2001 project which covered the whole country, and so it was most important. At 15:15 GMT: The first fireball appeared. It started from the eastern sky to northward along the horizon. Slow and long. This fireball was caught on the Video for 3 seconds from 15:15:27, but almost outside the camera field. 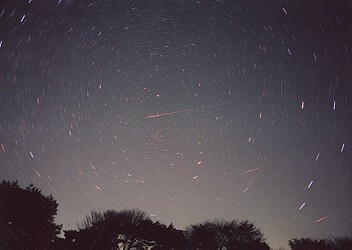 From 15:27 GMT onward, one to three meteors were seen every minute. Since this situation differed already from yesterday's (on the preceding night, just five meteors or so during two hours), KANAMARU said "It looks we will have a great, unexpected night!" 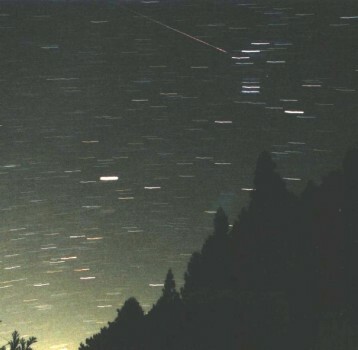 From 16:15 GMT onward, meteors increased up to 2 to 6 every minute. From 17:11 GMT onward, further increased. More than 6 meteors per minute. At 17:34 GMT The first peak came! 19 meteors a minute. 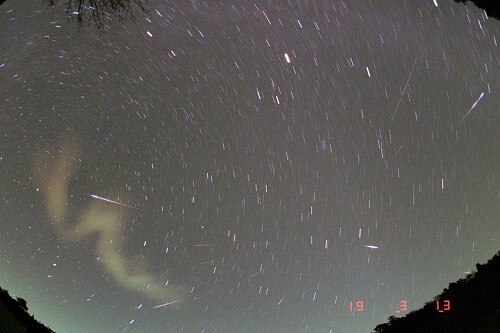 At 17:45/46 GMT 20 meteors/minute. Henceforward until around 18:40, we continually saw 30 meteors every minute. There was a hill at the eastern side (of altitude angle of 10 degrees), but the whole stars of Leo were seen, and it was easily verified that the meteors this night were directed from a point in Leo and radiated to all angles. We should say we had never experienced such a marvelous scenery. There were seen several meteor trails. We had prepared a camera to take the pictures of meteor trails, but we were too busy to manipulate it under this series of brisk happenings. 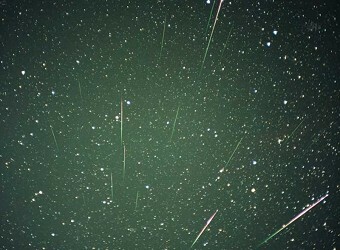 At 19:49 GMT, the meteors turned to decrease in number: Less than 10 per minute. At 20:00 GMT (5:00 JST), we closed our observations with much satisfaction. 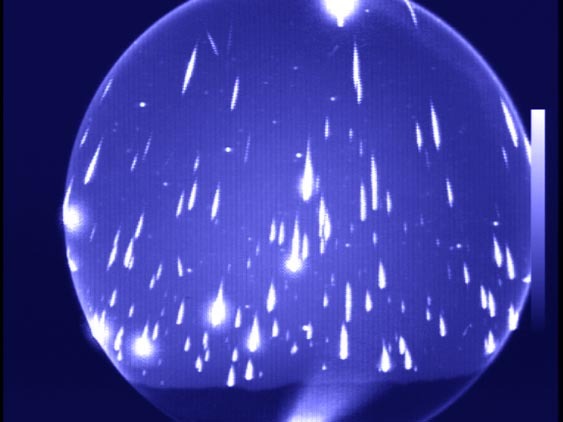 We felt really tired because of two night observations (just three hour sleep during 48 hours), but we were much pleased to have been able to witness the outstanding/historical showers of Leonids for the first time. Bravo! 4. Figure 1 is a bar-graph which shows the increase and decrease of the watched meteors counted every 5 minutes (made by T KANAMARU and N M). Time shown is JST. It shows a big peak that visited around 18:10 ~ 18:40 GMT where HR was 2000, and ZHR 5000. In the eastern country where the radiation point was higher, they say HR was upto about 3000. 5. The Video camera produced good results, better than expected. The instrument has a 6mm F0.8 lens, and the field angle is 68.5 degrees. It shot up to the fifth magnitude stars. 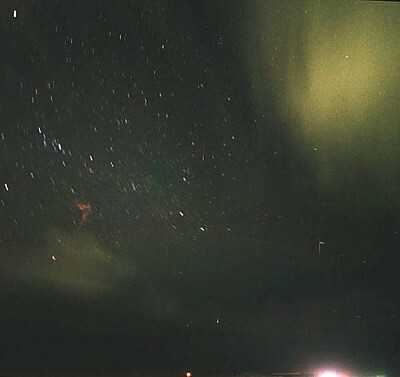 Due to the Project arrangement, the camera was directed and exposed to the northern sky. It recorded a total of 1366 meteors (out of which 1222 sparkled inside the lens field) during nearly 5 hours (from 15:06 to 20:16 GMT). 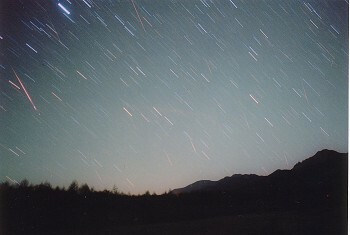 In particular, it shows 22 meteors during one minute from 18:13 to 18:14 GMT, indicating the time of the main peak. The camera covers just a ninth of the whole sky, and hence we can suppose there occurred a brisk burst of 200 meteors during the minute. Figure 2 shows the meteor frequency per minute. As well, Figure 3 is a refinement of the data in Fig 2 (made by N M), and the bar graph shows the situation per 5 minutes including the Z corrections. It should be noted there is shown up a short first peak around 17 h GMT. The eye-field of a usual observer is considered four times wider than the Video eye that we utilised this time, and therefore we can consider that four times many more meteors appeared than the statistics in Fig 3. The naked eyes however can easily miss many of 4th magnitude meteors that are easily checkable on the Video monitor, and so we may conclude that the observations by the naked eye just produce two times many more meteors than the result through Video eyes. We hear the total results obtained by a total of 40 Video cameras of the Astro-HS 2001 Project which were stationed variously whole over the Japan islands will be soon accumulated and reported. by the use of PENTAX SPF/CANON 7S 50mm F1.4 on Fuji Superia 800.
by the use of 28mm F3.5 Lens on Fuji 800 film. by the use of PENTAX MX 35mm F2.4 on Fuji 800 film. by the use of Minolta 28mm F2.8 on Kodak Gold Max 800. 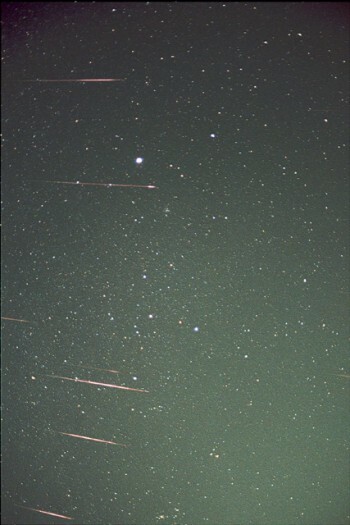 Leonids of Hisaya HASEGAWA at Ibaraki. on Fuji Superia Zoom Master 800 (ISO 800) by using an Olympus Zuiko 50mm F1.8. 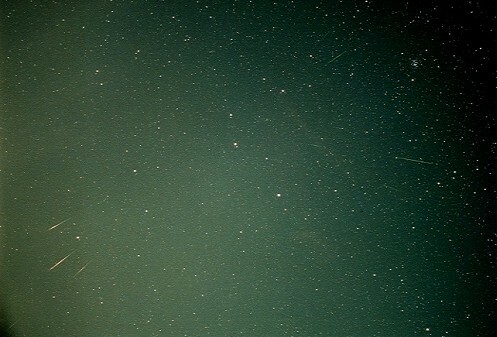 The bright star near the rightmost meteor is alpha Canis Minoris. by the use of Nikon 50mm F1.4 about 5 Minutes on HG1600. on Fujicolor SO400 by the uise of Pentax K1000 with an F2.0 lens. Thank you for your prompt kind reply. Your description is always beyond my knowledge, and so always instructive to me. I did not know that the professional observations in South Africa ended in the 1970s. And I vaguely understand why the amateur group is losing its access to the hill nowadays. > give rise to the huge storm observed in the western part of the U.S.). > comparable encounter with Leonid debris until 2098. 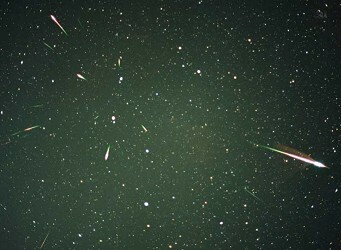 Your email reached me at 5:48 JST this morning, and read it just after returning home from the watching of the marvelous Leonids shower for my part. I watched up until 5:30 JST (20:30 GMT on 18 Nov) from 1:30 JST. I suppose you watched around 10:00 GMT, because I heard a peak was predicted so in North America. 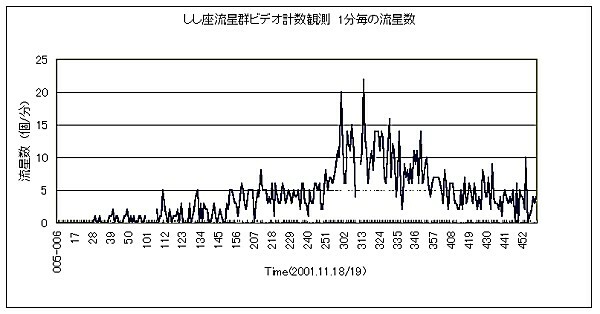 In Japan, it was predicted the peaks would come around 2:30 JST and 3:30 JST this morning by several astronomers. Among them the prediction (peaks at 2:31 JST and 3:19 JST) by a young astronomer called David ASHER has been popular in Japan (this person is a British, but looks like an Oriental), and as I watched, the peak came as he predicted. I felt his prediction was really praiseworthy because we were several times betrayed until 1998. I hear ASHER had a plan to watch the streams somewhere this morning in Japan. His theory seems to take a full account of the perturbations received from the planet Jupiter, and he was so successful in predicting exactly the date and hour of the burst of Leonids in 1999 and 2000, and this is the reason he has been regarded as trustworthy. Lots of meteors really happened to appear. I started to go to my favourite dark site at 1 o'clock, but already from the front glass of the car I could see several bright meteors. The burst soon came as I reached the watching place. Some bright, some long, some orange, some green, all around the sky, even at the rear side at the west sky. I felt the peaks came really twice. The later one was more brisk, and the peak must have had two sub-peaks. It was fascinating to watch lower meteors down to the skyline from the rising Leo. I wanted then to watch bright meteors falling down to the sea, and so I moved to the coastline. I stayed until 5:30 at Tojinbo near the NOTO peninsula, but I could not catch such a meteor because the sea-horizon must have been hazy, and the peak already passed though several bright meteors still came across. I could not estimate the frequency at the peaks, but the NHK-TV is now reporting that there occurred more than five thousands per hour. Even in the light-polluted Tokyo, it is said they could see more than ten per minute. Much less than the legendary 1966 event, but seems to be comparable or more with the 1999 European case. An astronomer is saying in the TV that the event this morning occurred for the first time in these a few hundred years in Japan, and this was the last as you communicated. Next year North America seems to have another chance (according to ASHER's theory), but unfortunately under a full moon. I am sorry I wrote too long, but I suppose the Japanese amateurs will talk about this event for a while. As I hear now, TSUNEMACHI seems to have had clearer sky and watched much more meteors than me in a dark countryside in an eastern Japan.